Two original amigurumi crochet patterns by June Gilbank. Who would have guessed that the legendary Yeti (aka Abominable Snowman) and Bigfoot (aka Sasquatch) would be so cute? So that's the secret they've been hiding for all these years while living in the shadows! 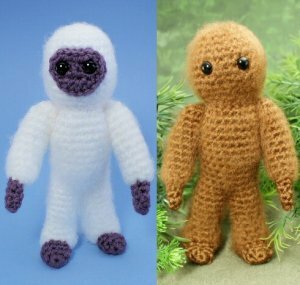 Additional info: The Yeti and Bigfoot are crocheted with regular yarn, but have brushed bodies, so you'll need a wire brush if you want to make them fluffy like the samples pictured. Their arms are jointed with yarn at the shoulders. Full instructions on brushing and jointing are given in the pattern. Yeti is inspired by the Teddy and the Yeti comic book series. Date Added: 10/30/2014 by channing l.
Such a great pattern! Great, simple shaping, and a really cute finished product. Date Added: 03/28/2013 by Sara J. Date Added: 11/02/2010 by felicia g.